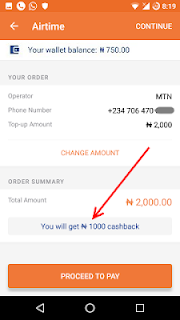 Jumia Nigeria has launched a new app called "JumiaOne" which is a platform that allows you buy airtime, data, pay bills and get 50% cash back on your first purchased. For instance, when you buy airtime of N200, you get N100 back into your account. Similarly when you pay for GOtv subscription of N2000, you get N1000 cash back. Isn't this cool? Dent app, TopUp Africa, Opera News and so on. JumiaOne is a new innovation by Jumia and the easiest way to do an airtime top-up and pay for your mobile data & bills. All at the BEST price! ✔️ Pay your bills with zero service charge! Save N100! ✔️ With all in one Jumia app, save data and space! ✔️ Pay online securely, guaranteed by Jumia. 👉 For iOS users, download JumiaOne app Here. Let's know your experience using this app. What about if i purchase product from them like phone what 30k. If you have good Glo network, i advice you to go for glo plans as they are still the cheapest right now.